It’s a surprising fact that millions of people across the UK make time for house-hunting during the busy Christmas period. People use their time off over the festive period to window shop for a new property from the comfort of their own home, and we then return to work in the New Year to a mass of enquiries. Last year this resulted in us letting 213 homes in January alone. In order to achieve your first goal of 2019, much of the work needs to be done before Christmas. Potential tenants use the holiday week as an opportunity to consider and discuss properties with those around them, meaning that they are ready to proceed at the start of business in January. As such, you need to start taking active steps now to put your property on the market: read up on the legislation, meet a couple of different agents, and start planning your strategy. 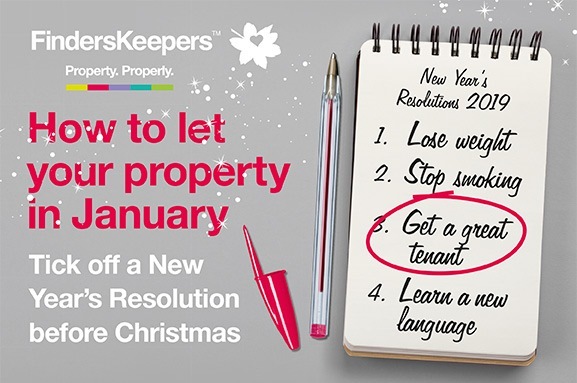 You (or your current tenants) will not be bothered with viewings at the property over the holiday break, but it is vital for your prospective tenants to be able to look online, whet their appetite and contact us to book viewings in the New Year. Why Finders Keepers: broad goals versus specific goals. Finders Keepers will do this by starting with an honest valuation based on similar properties we have let in the area. This way you avoid the over-inflated quote, which is then sheepishly dropped in the New Year, missing all of that Christmas traffic. Then, once the viewings start, we won’t just get you the first tenant through the door, we will get you the right tenant – and if you have a well-matched tenant you’re much more likely to have a happy tenancy throughout the rest of 2019. Your property will then be managed by one Property Manager, who is based locally to your property and carries out the full tenancy lifecycle (including the 24/7 emergency line) in-house.